“One happy snow friend was wondering what to do.” And thus begins a short picture book story called The Happy Snow Friends Counting Book – featuring a collection of needle felted snow friends as they gather together on a winter’s day. 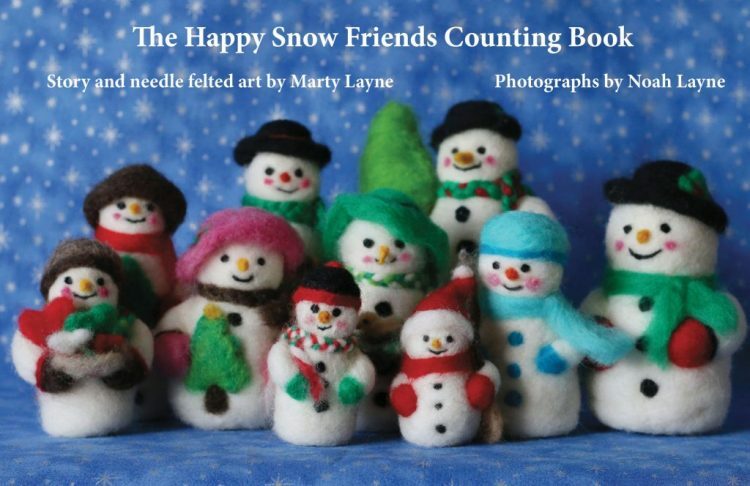 The book written and crafted by Canadian author Marty Layne, aims to bring together the joviality of snow people with the early skill of numbers and counting. Written in a lilting style of poetry, this story is also able to be sung. You can find the music notes on the inside of the back page. By the end of the book, you meet 10 ridiculously cute little snow friends of all shapes and styles and sizes. Marty’s story of the snow friends began when she needle felted a whole collection of them and sold them for charity at a Christmas sale. Needle felting is the process of taking wool and shaping it with a special needle to make sculptures. Her skills are beautiful. Deciding that she wanted to continue to use her snow friends for charity, she created this colourful story. Her son took the photographs. For each sale of this book, $1 will go to FoodBanksCanada. I read this book with my 3 and 5-year-old. They loved it so much that we ended up reading it about 4 or 5 times in a row before I had to call it a night and tuck them in bed. The next morning, they had snowmen on the brain and begged me to help them make their own snowmen. So into the craft box we dove, pulling out all the felt we could find. 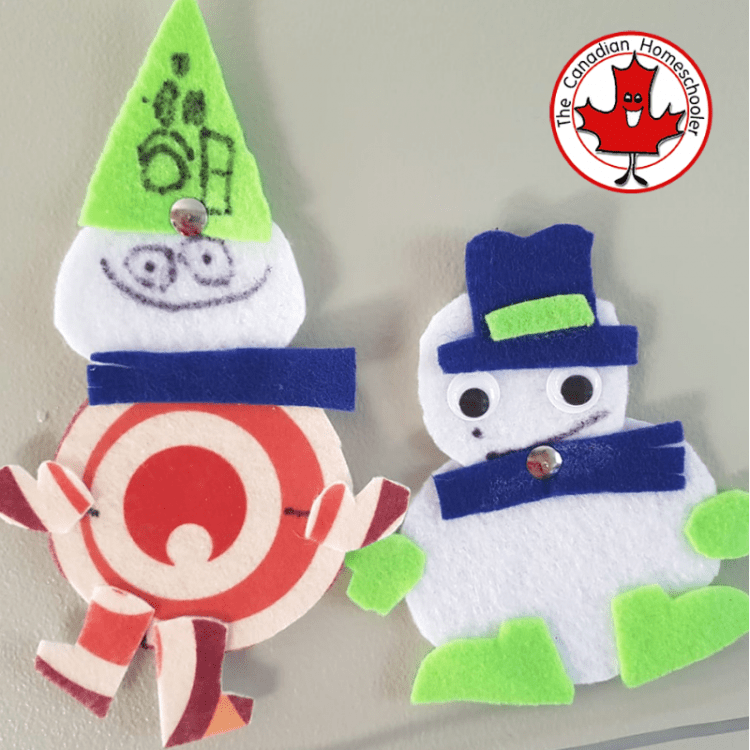 Although I don’t have the ability to make 3D snowman like they wanted (since they wanted to make friends like Marty’s)- we did manage to come up with some cute 2D snow people designs together with our craft supplies. This book is going to be part of our regular winter book collection – because it’s beautiful, fun, and inspires creativity in my kids. And, if Marty ever decides to sell a snow friend to go with it – sign us up. You can never have too many snow friends! Disclosure: Marty sent me a copy of her book for a review. I was not compensated for my post and all opinions are my own based on our experiences.